The promo videos are still a bit unbelievable. This really large menacing motorcycle in matte-black and a sort of military matte-green flies off a mound of dirt with all the grace of a bomber. It lands with a thud you can feel on your couch. You marvel at the suspension which absorbs the landing so easily, so deftly! The Ducati Multistrada has always been exceptionally capable. But this is Ducati making, effectively, a dirt bike. Wow? Or oh my? The 2016 Ducati Multistrada Enduro may be huge but its capability off-road never comes into doubt. But using that ability is another thing altogether. Enduro mode allows you to slide the rear wheel as well as lock it on the brakes while cranking up the pre-load all the way to give you the maximum ground clearance. When the Ducati Multistrada arrived in 2003, the Pierre Terblanche design was odd to put it mildly. But the capability of the machine was already receiving acclaim. 13 years on, the Ducati Multistrada looks as sensational as it feels to ride with its native ability and cutting-edge electronics, making it sublime in feel and precision. The current Ducati Multistrada family was born in 2015 boasting many things - IMU-equipped electronics, cornering ABS, LED headlights and most important of all, the world's first motorcycle-borne continuously variable valve timing. That last bit is special  it worked on all four valves of each cylinder and it remained a firmly desmodromic system. 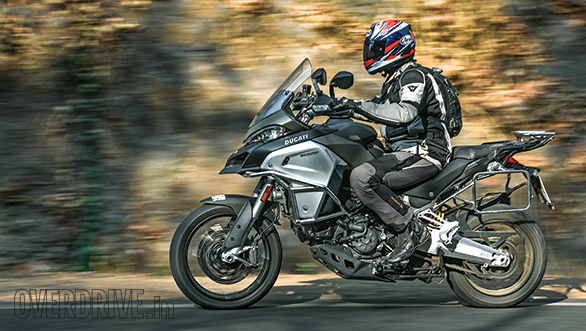 And now, the 2016 model year saw the arrival of the off-road capable Multistrada Enduro. It's here and on sale. But should you buy one? This menacing head light is the best we have used on a motorcycle yet. The low beams offer a great, well-lit spread while the six LEDs in the middle that form the high bream project a powerful spotlight into the distance. Very impressive! The evolution of the Ducati Multistrada design to embrace the chunkier, more rugged ethos of the off-roader is pleasing. The matte-black beak has a more substantial lower lip which gives it both substance and splatter-prevention. The bigger change is the body work. The rear has hardly any while the matte black plastic tank - hidden on the normal Multistrada - grows larger and extends downwards right to the timing belt cover to offer 30 litres of fuel capacity. It is covered nicely by a brushed aluminium panel on each side which looks very, very high-end as well as very, very nice. 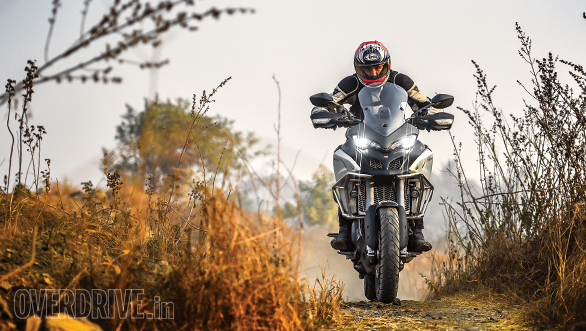 The taller overall stance makes the Multistrada Enduro extremely imposing to look at and if you thought the Multistrada was a big motorcycle, you'll think the Enduro is absolutely huge. While the 1,198.4cc 90° V-twin has not changed in any way - it still makes 160PS and 136Nm, this is now a 254kg motorcycle in kerb weight. That is 13kg more weight without fluids and 19kg more with a full tank of gas. It isn't slow though. Top speed is 240kmph and 100kmph comes up in 4.1 seconds. The fuel tank has a huge influence on the performance though - a full tank will slow it down a bit to be sure. It's economical too. City economy is 13.6kmpl - not outstanding - but highway economy at a steady 80-95kmph cruise was 27.10kmpl! It feels a little slower than the basic Multistrada, but Ducati has lowered the first gear for off-roading while adding three teeth to the rear sprocket to lower the overall gearing and give the motorcycle more oomph. On the road, the Urban mode - soft engine response and a 100PS power cap - feels slow. Slow compared to the other 160PS modes. But the Multistrada Enduro can move. Impressively for its size, even. Sport and Touring modes allow small slides while Enduro mode allows as much sliding as you can handle. On Mumbai's slippery concrete, the Enduro is almost constantly being reigned in by either traction or wheelie control. This is a good thing on a motorcycle this large and this powerful. I only tried the Enduro mode briefly because it scares me to off-road a 250kg, 100PS beast of this size. But the odd jump or slide quickly suggest that while a toy-sized dirt bike this is not, the capability is genuine and you'll need skills to use all the ability the money buys. 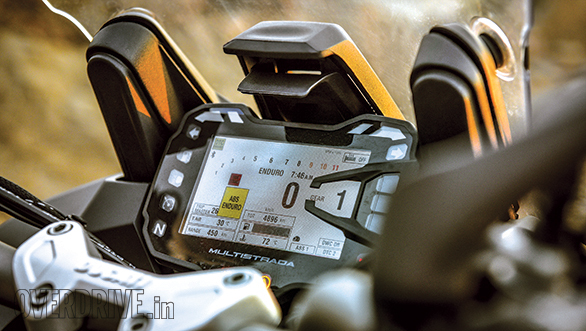 The Ducati Multistrada Enduro screen changes from light to dark based on ambient light. The display is well-configured and the menu systems are intuitive too. See the 'beak' above the meters? They allow you to adjust the screen, it is at its lowest position right now. The big surprise is the behaviour of the engine. Variable valve timing makes the motorcycle as smooth as we've ever seen a Ducati at low revs - impressive! Mid range is purposeful with a machine gun roar accompanying extremely rapid progress. The top end is surprisingly fierce and screaming to the redline in the lower gears is frighteningly fast. The Enduro is slower than the road Multistradas for sure, but on its own it's fast enough to make you cry uncle. 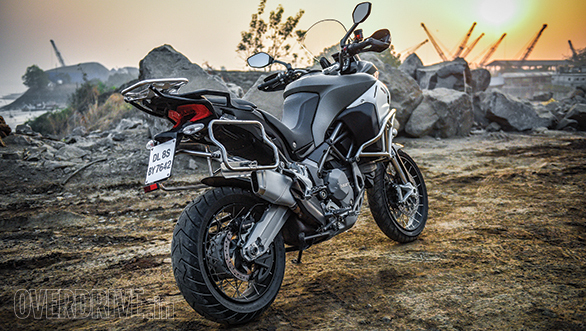 The basic frame between the Multistrada and the Enduro might be similar but there are many changes and they add up. In geometry, the steering is slower - 1° more rake and a smidgen more trail. The new double-sided swingarm increases strength and also the wheelbase by a significant 65mm. Essentially, Ducati slowed down the chassis response of the Multistrada to promote control off-road. Next, Ducati gave the motorcycle taller suspension - the electronically adjustable, semi-active Skyhook Suspension on the Enduro takes the 170mm travel on the Multistrada to a whopping 200mm. 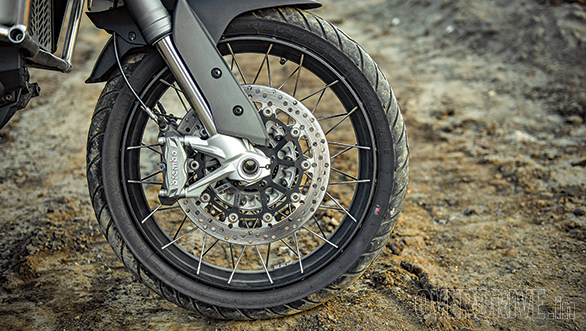 Then Ducati gave it spoked wheels - better for off-roading with tubeless Pirelli Scorpion Trail IIs as standard, or optional harder-core Pirelli Scorpion Rally tyres. The front wheel is a 19-incher, not the 21 a full off-roader would prefer but better than the standard 17" on the Multistrada. Ducati raised the handlebar on risers for the Multisrada Enduro - you can see how the forearms rise up to them. The higher bars mean a more natural position when you're standing up on the pegs for bad roads or off-road. See the luggage frames at the rear and above the tail light? They're mounts for the optional Ducati aluminium panniers and top-box. You can select from a total of 20 front and rear suspension settings, front and rear, across four riding modes to ensure the ride and handling feel like something you expect it to. The difference the electronics make is vast, and a simple menu system means that you will end up using it quite a bit and it does enhance your experience. Land a jump off a big speed breaker on a 250kg behemoth in Urban or Enduro mode and you'll be converted. I promise. The feel of an unstoppable, capably suspended motorcycle that knows how to deal with tarmac and then continues to sing its lusty song on the dirt was the promise. Delivered, I say. But the flip side is that the Enduro has become this extremely tall, large and unwieldy-heavy motorcycle at slow speed. A full tank of gas means a lot of trouble lifting it off the side stand as well as when parking, slow U-turns etc. During our shoot, 6'2" Rishaad took over all parking and U-turn duties, especially off-road, because despite my 6' height, I was short of inseam, especially off-road. Ducati has endowed the test bike with the full complement of luggage. It isn't in the pics because it makes the motorcycle heavier still and it is optional. To its credit, with the right mode selection, the Enduro shrugs off the weight at speed and produces a remarkably effortless experience. But in traffic and off-road, slow manoeuvres are all seriously hard work. The big hurdle for me on the Enduro was not the size though. That's a challenge but the hurdle is the heat. The big tank obstructs the natural flow of hot air from the radiator and it gets blown up into your thighs, crotch and abdomen. Add the lack of ventilation, thanks to a low seat and tall screen, and you're baking slowly. It's pretty bad in traffic but I was surprised to note the heat even at a high-speed cruise on a warm day. It is hot enough for you to think twice before casually taking the Enduro out for a spin. 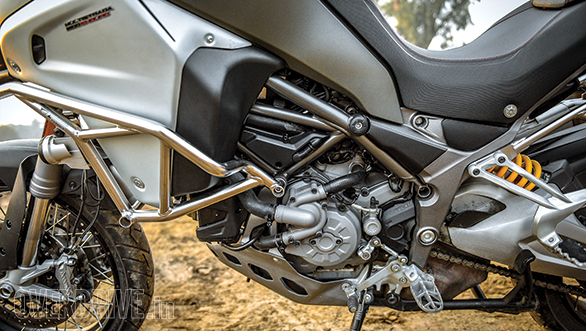 The 200mm suspension travel makes the Ducati Multistrada Enduro a fairly tall motorcycle. Ducati offer the motorcycle in South East Asia and India with the (otherwise optional) low seat but the seat height is still 850mm. 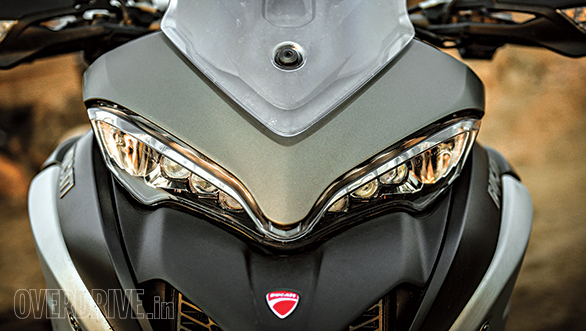 Note the double-sided swingarm, its specific to the Enduro and will also come on the incoming Multistrada 950. The size and weight will compound the things you need to think about before you ride. To me, if the Enduro is your primary big bike, you're either constantly chasing the horizon or not riding a lot at all. But that should not take away from the fact that the Ducati Multistrada Enduro is impressively capable. On the highway in 1,000km per day mode as well as off tarmac. It has this air of rugged, unbreakable strength and capability that will make it super easy to ride around India, and despite the complexity, the electronics make it a remarkably easy motorcycle to ride too. Given all that, the expensive price tag, Rs 23.08 lakh on-road Mumbai, is not hard to justify from the perspective of value. I just wonder who will ride this machine hard enough and far enough to really extract all that value from it.